Hi, does anyone know if there is a compatibility issue with Premiere CS4 and Windows 7 home premium? I keep getting "Error 1603. Fatal error" during installation. Windows 7 64bit pro, ultimate or home?? I'm under the impression, that the PRO version might be best suited for the CS4 suite.. Does anybody want to chime in, as to which Windows 7 64 bit is preffered? I've run CS4 under both Home Premium and Professional, both 64 bit. I don't know of any Windows features CS4 would need beyond Home Premium, but the features in the higher versions won't harm CS4. I know Premium is limited to 16GB of ram and both Pro & Ultimate are far higher. And I think Premium is limited to one CPU whereas I know Pro/Ultimate are limited to 2. Some video gear needs Pro as a minimum (such as some Matrox products). Win7 Pro uses all cores. In my case all 8 of them. I believe the current limit is 16 cores. 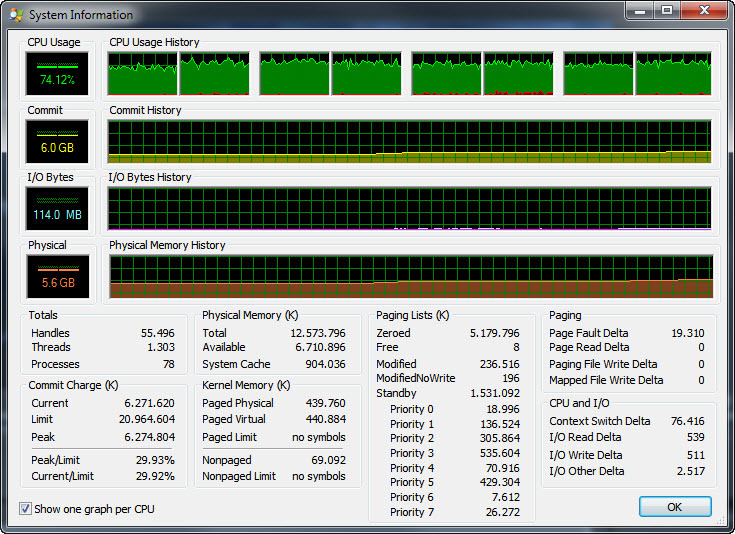 This picture shows all cores used during encoding with AME. Sidenote: Rendering the timeline does not appear to be using HT, so previews only use 4 cores on my system, but that may be caused by the fact that my CPU usage during rendering never was more than 12%. During encoding it was far higher. Sorry if I misunderstood you. Reading your message again it looks like you are talking about physical CPU's, not cores. Last edited by Harm Millaard; March 7th, 2010 at 06:09 AM.